When Did Kids Become The Center Of The Universe? Laurie Cunningham is tired of losing her friends to their kids, and as a soon-to-be mother herself, she vows to always make time for the adults in her life. When I got married two years ago I was adamant about one thing: no children at the wedding. OK, I was adamant about many things. I wanted to get married at an event space (no church), I wanted our friend Tom to officiate (no priest), I wanted to limit the guest list (no distant cousins we didn’t know) and I didn’t want a wedding party (no taffeta either, please). I was 38 when I married, a late bloomer if you will. I had been a bridesmaid more times than I could count. At every wedding I attended, I took mental notes of what I liked and what I would definitely do without. While flower girls and miniature ring bearers were adorable and often stole the show, I wasn’t crazy about guests piling into the church with their children, then spending the ceremony distracted with keeping them occupied and quiet. I mean, who wants to hear a baby start wailing as you’re about to say, “I do”? At the reception it often got even worse. Parents couldn’t freely socialize because they were busy getting food for their children, taking them to the bathroom and keeping track of their tiny suit jackets and dress shoes. When the band or DJ started up, it wasn’t long before the dance floor turned into Romper Room. I know I’m in the minority on this, but I’ve always felt that weddings should be an adults-only affair. 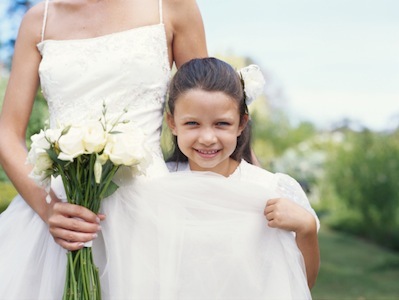 Most people feel that weddings are about family, and what’s more “family” than having the wee ones around? For my friends who got married in their mid-20s, keeping the kid quotient down wasn’t much of an issue, since we had just graduated college and didn’t have any yet. But by the time I got married 15 years later, nearly all my friends had children. So did my brother and my husband’s two brothers—a collection of two baby girls and three toddler boys. I’d be left mid-sentence, struggling to keep my frustration and sense of abandonment out of my voice. I felt like one of those husbands who felt jealous of the new baby yet terribly guilty for being that emotionally unevolved. I mean, really, it’s a baby. Of course she had to go. Really? But we haven’t talked in months. Can’t he and your husband go alone? “OK, talk to you later,” I said. I had one friend who sat by while her 10-year-old daughter complained openly to me about not being invited to our wedding. “It’s not like I’m going to go ‘Wah! Wah! Wah!’ during the ceremony,” the 10-year-old said, mimicking a crying baby. Then her mother asked me whether she could at least bring her to watch me get ready. “Abby would so love to see you in your dress,” she said. Really?? I’m sorry, when did this become all about her? I don’t subscribe to the philosophy that children should be seen and not heard. But when did they suddenly become the center of the universe? When did parents start making their children’s feelings most important? Why do they assume their children are welcome everywhere they go? And is this really good for them? In my opinion, no. When I was little and tried to ask my Mom something while she was talking to her friends, she’d say, “Laurie, I’m talking to Lorraine. You’re interrupting. You need to wait your turn.” As far as I can tell, asserting her adult time did no permanent damage to my fragile self-esteem. Neither did leaving me and my brother with a babysitter when she and my dad went to weddings, dinner parties, and other adult events. In fact, I relished the opportunity to eat all the ice cream I wanted and watch TV way past my bedtime. We won’t have to wait much longer since I am eight months pregnant, due with our first baby in early June. It’s been a tough pregnancy, one with lots of nausea and my first real meal after this baby is born may just be these words. I sure hope not. But when I look around, I don’t see a lot of good models for how to maintain my individuality, marriage, and friendships while being attentive and devoted to my child. Laurie Cunningham is a former newspaper reporter and magazine editor who now works at an international law firm in Chicago writing web copy and teaching lawyers how to write in active voice and use shorter sentences. In her spare time she blogs about fascinating topics like bad hair days, annoying neighbors, and the top five things she swore she’d never do until she got pregnant.